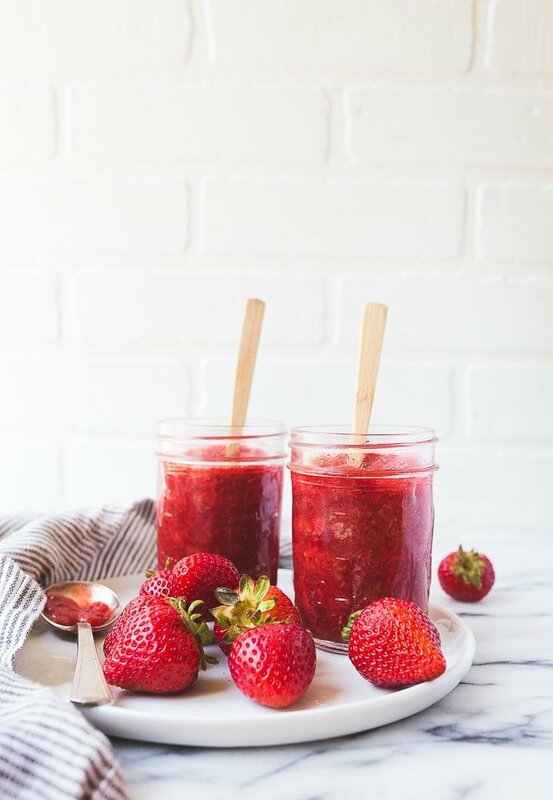 Small batch strawberry jam: just TWO ingredients! Have you ever taken your toddler strawberry picking? I’m considering taking Camille, who is 2, but I have some questions. Do they teach the kids about bees and how not to piss them off and elicit a sting? And do they go over exactly why you shouldn’t eat unwashed berries covered in dirt in the field? I’m one of those crazy Mams that doesn’t buy sweetened yogurt for my kid (grass-fed full-fat plain, please! ), and so I made some jam to stir into her yogurt for a flavor boost. I can’t get over how much FRESHER this strawberry jam tastes than store-bought. It has a bright, acidic FRESH strawberry flavor that tastes like real berries…with a little extra sweetness. And I have to say…the red in these photos hasn’t been enhanced. It’s just bright red because it’s so fresh! Recipe makes 1 pint or 2 half-pint jars. 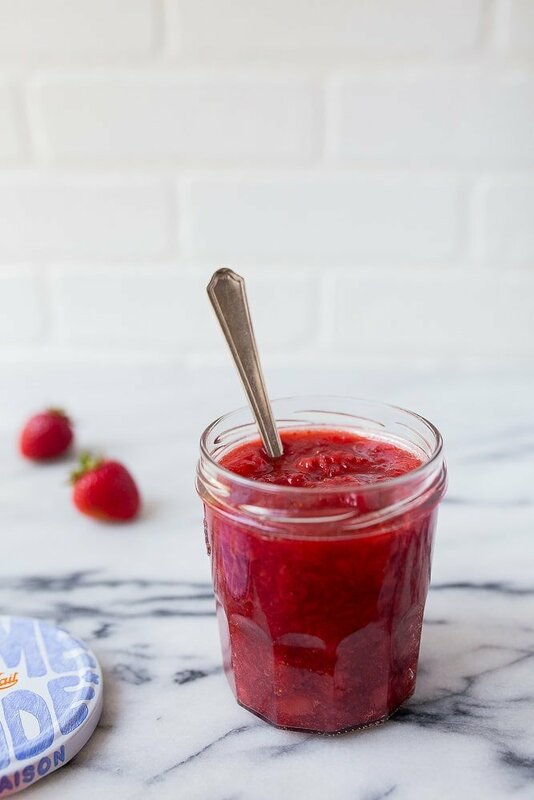 This small batch strawberry jam is great on ice cream, stirred into yogurt, and even right off the spoon. I also have plans to use it for a dessert for two, so stay tuned for that! I used 2 pounds of strawberries to make just 1 pint of jam. Scale it up as you need to, but if my recipe for a small batch of apple butter is any indication, you guys love making small batches of jam. All you need is a surplus of fresh strawberries and a little sugar. And some time. You definitely need time. I’m not going to give you hard and fast rules for making this jam. I want you to cook it, while stirring every 2-3 minutes until it starts to feel like it’s sticking to the pan. It will thicken and threaten to stick to the bottom. Take it 1 minute further while constantly stirring. It will set into jam as it cools, I promise. No pectin needed. Though, if you have some leftover from my strawberry pate de fruit, I’m sorry about that. That reminds me, I need to make those again. Oh, and these are the exact jam jars I used in the photos. They’re half pint mason jars that hold 8 ounces. Small batch strawberry jam, makes 1 pint or 2 half-pint jars of jam. In a medium saucepan over medium heat, add the berries and sugar. Mash the berries with a potato masher to get some of the juice going, and then bring to a simmer. Cook the jam until it thickens and starts to cling to the bottom of the pan. Stir it ever 2-3 minutes, and keep an eye on it, about 10 minutes. Once it threatens to stick to the bottom of the pan, stir it constantly for 1 minute to thicken further. Pour into a pint jar (or two half-pint jars). Let cool to room temperature. Store in the fridge. Use within 2 months. We took our 22 month old strawberry picking twice. She got the idea pretty quickly but you need to pre-screen berries for her by pointing out the red but not too ripe or bug eaten berries. There weren’t a lot of bees in our fields. She was also very cross with us the first time for not letting her eat them unwashed in the field. The next time we went I brought a bottle of water and a small cup to rinse off a berry or two while we were out there. And had an extra bucket in the car for larger scale rinsing because once she tasted one berry she didn’t want to stop eating! That said, if you want a decent quantity of berries one parent needs to go picking more quickly on their own. Also the toddler really wanted to carry the bucket so there might be some trickery there too. This is VERY helpful, thank you, Emily!!!! Will it work with raspberries ? Can I cut down sugar abit? Awesome! raspberry is my favorite, so I’m excited to see that version as well. I made raspberry jam, 4 cups of fresh raspberries, 3cups sugar, 1/4 cup fresh lemon juice and tbsp zest. Boil till thickened. If canning I filled 12 half pint jars and boilef the filled jars for 10 mins. Cool over night and jam tastes awesone!! This recipe is so simple I can’t wait to try it! Do you measure 2lbs before or after hulling/cleaning ? Strawberry Mousse demands this jam!!! and so do I…. I’ve got to try this! I LOVE strawberry jam! This is a great recipe. Every one should try a little home made jam. I also add the juice of a lemon, when I make strawberry jam. I make it often(we have a very long strawberry season here in Florida). Strawberries right off the vine(rinsed of course) are rarely as sweet as jam so I use fresh Lemon, preferable Meyer Lemon to get back the fresh taste that the sugar steels away. 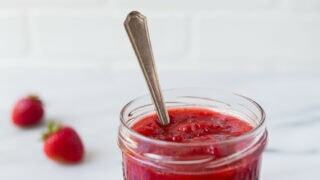 Personally, I love to take a spoon right to the jam and dig in – but my husband insists that it improves a peanut butter and jelly sandwich so much, especially with home-made bread! Love you recipes. Christina, I’ve been doing small batch canning for a couple of years. Definitely will be trying this. I’ve bought all you cookbooks. Love the Tuna Casserole and French Onion Soup. Also loved the little Lemon Cakes. I’m working through. The Recipes in “Comfort and Joy”. Keep the recipes coming. This looks so good! Our local strawberry farm sells jam during the season and it’s amazing. I wouldn’t mind trying this out though! It seems so easy. Mash all together and boil, once boiled add pectin boil that for 1 min and than fill jars if canning. Fills about 6 or 7 1 pint jars. Decided to try this because it required no pectin. I found it to be too runny for jam, but will definitely use it this weekend for Strawberry shortcake. It is deliciously drippy! Can you use frozen strawberries? I had bought a lot of fresh strawberries last month and decided to freeze some as I had way too many for my husband and myself. They are bright,red, plump strawberries that froze beautifully. May I scale down your recipe to half of it? If it’s fail, then what can I do with the strawberries sugar? Hahaha…..
You just want a 1/2 pint of jam? Yes, because not always use it and only 1 person to consume it. 1 pint quite a lot….. If can’t finish, it will be waste…..
Hmmm..okay, I would try to halve the recipe and keep it in the fridge. Good luck!